KROME, the best-selling synth focused on packing the most usable sounds into an easy to use platform, has received a major refresh. Updated to meet the needs of the current music scene, KROME EX has a special emphasis on sounds that can immediately fit into productions of all types. In addition to standard sounds that will never grow old, KROME EX provides numerous new programs and PCM data, including piano programs prepared specifically for this product. This instrument provides high-quality and immediately-usable sounds that take full advantage of the KROME's high performance specs. The new body also features a newly revamped build and look to accompany the new sounds. A music workstation for gigging musicians and producers of all stripes. The KROME EX. Keeping up with a worldwide music scene that evolves daily is a challenge for any instrument designer that Korg is excited to take on. KROME EX answers the question "What sounds should be provided by today’s go-to workstation synth?" First we focus on EDM (Electronic Dance Music) that has conquered the world. Rich, effect-laden polyphonic sounds that evoke massive rooms, clear and crisp synth leads, and punchy drum kits that get listeners moving are some of the new staple sounds that we've added. Ethnic instruments such as steel pan, kalimba, and kokyu, as well as Hollywood-type sound effects frequently used in movie trailers or commercials are also newly provided. KROME EX features a musical catalog for today, where users can simply select a program and immediately begin composing fresh-sounding tracks. Having bread-and-butter sounds that are always usable is a top priority for our sound designers. The KROME EX is equipped with sounds that are intended for longevity, such as the piano and electric piano that are the foundation of any keyboard, as well as drums that are indispensable for a workstation. Piano sounds are critically important for nearly every keyboard instrument. 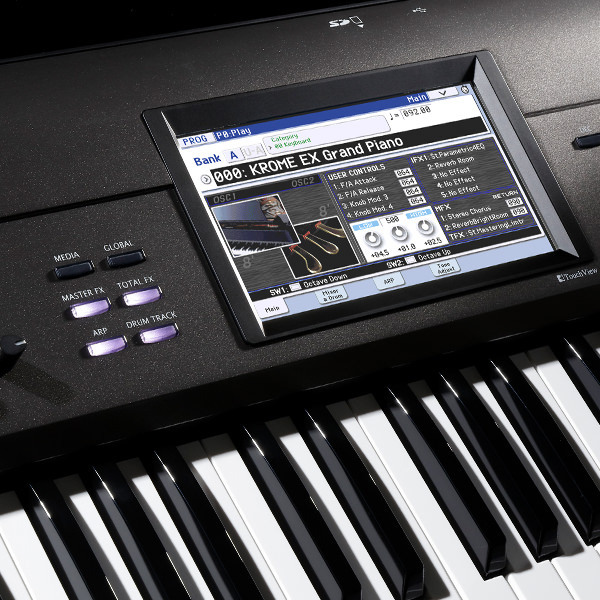 The KROME EX is equipped with new grand piano sounds. These sounds were recorded under the supervision of Seigen Ono, the authority on DSD recording and mastering, and provide a beautifully clear sound that builds on the success of the "German D Grand" that exemplifies the original KROME, further expanding the range of piano sounds. An upright piano frequently used in pop is also newly included. For many keyboardists, a realistic electric piano sound is just as critical as an artisanal acoustic piano sound. KROME features three types of electric pianos. Eight velocity levels have been used to ensure faithful expression response. Lavish amounts of PCM memory have been used for this purpose, to the extent that just one of these electric piano types contains more sample data than the entire sound memory of a typical PCM synthesizer. In addition, the vintage amps, cabinets, and classic effects so important to these timeless sounds have been painstakingly modeled, offering a fully immersive electric piano experience. When producing on a music workstation, the built-in drum kits play a major role. The KROME EX provides a massive collection of more than 2,500 drum samples to power its 48 preload kits. One of the notable kits is "Jazz Ambience Drums." Its generous sound takes advantage of KROME EX’s high-capacity PCM memory to deliver a completely new level of clarity and realism. Adjusting the mix balance between the direct sound (a mic placed near the head or cymbal) and the ambient sound (recorded from a distant mic to capture the resonance of the room), allows you to create a rich drum sound that has exactly the balance and character that you want. Simply pressing a single button turns on the Drum Track feature, providing realistic grooves played by professionals using the KROME EX’s studio-quality drum sounds. Play along or incorporate them into your music production. In addition to more than 600 preset patterns inherited from KRONOS, there's plenty of space for saving user patterns as well. Drum patterns can be created and used with the sequencer, as well as providing a rhythm guide while you play, or they can be used creatively in your live performances. In addition to piano, electric piano, and drums, KROME EX has a plentiful array of sounds to cover a broad range of styles that will meet a wide variety of needs. Stimulate your creativity by selecting any of the 896 Programs or 512 Combinations. Each one has been carefully created by professional studio and performing musicians to provide exceptional real-world use for both rich clean backing parts or soaring solos. Plus you can tweak, customize, create, and save your own sounds as well. In Combination mode or Sequencer mode, two arpeggiators can be run simultaneously. In addition to standard arpeggio patterns, these arpeggiators can generate guitar or bass riffs, drum patterns, or they can even be used as building blocks for sound design, to create pads, synth sounds, and sound effects that include subtle motion. You're also free to edit any of the patterns to create your own custom originals. 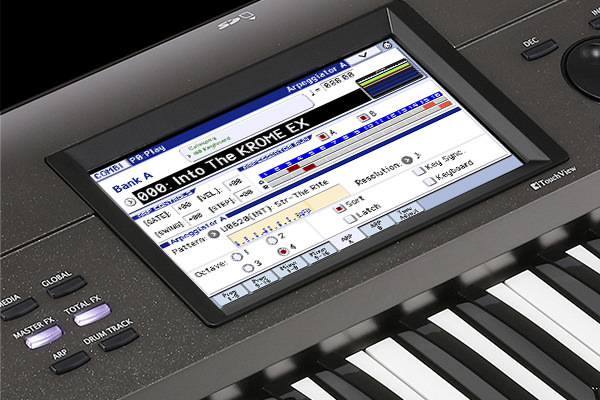 KROME EX has a full complement of the features you’ve come to expect from a KORG Music Workstation, starting with the 16-track sequencer. But there’s much, much more. KROME EX comes complete with a rich suite of tools to jumpstart your creativity. There's the convenient Auto Song Setup function; if inspiration strikes while you're playing a program or combination, simply press the REC switch to start recording immediately. Each Template Song assigns popular sounds to sequencer tracks through pre-routed effects to match a specific musical genre. Achieve lightning-fast arrangements using KORG’s Cue List, and build an armada of instant-access patterns using the RPPR (Realtime Pattern/Play Recording) feature. Go back and you can make any changes using the convenient piano-roll editing. 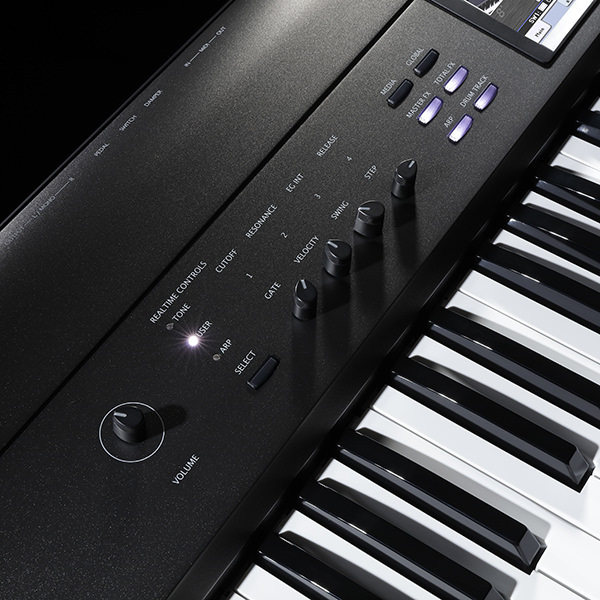 KROME EX 61 and 73 models feature a semi-weighted keyboard; with great feel and response that are ideal for playing any style of piano, to dynamic organ performance, to pyrotechnic synthesizer solos. 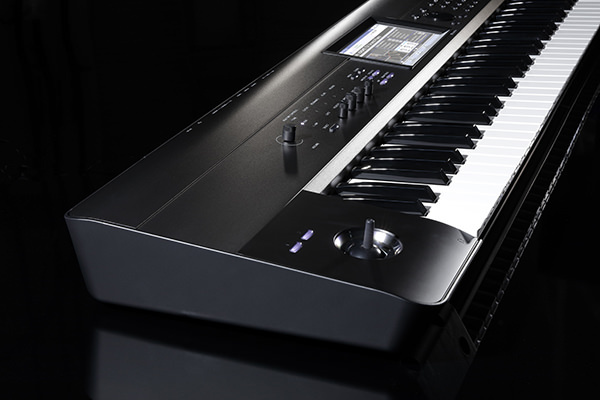 KROME EX 88 is equipped with KORG’s NH (Natural Weighted Hammer Action) keyboard, ensuring that every nuance of your playing dynamics will be expressively reflected when playing sounds such as piano or electric piano. Wrapped in dark colors, the body of KROME EX features flowing lines that utilize curves on the sides and a lustrous aluminum front panel surface. This distinctive design will stand out even on a crowded stage, leaving a strong impression on the audience for its appearance as well as its clear sound. KROME EX’s huge 800 x 480 pixel TouchView Color display can show numerous parameters at once, ensuring great visibility. Simply touch the screen to change sounds or edit parameters. Finger-drag editing is also supported, allowing you to use the on-screen sliders and knobs directly. Numerous functions take advantage of the TouchView interface, such as the piano roll editor, a stopwatch that’s convenient for keeping track of a live performance, and a calculator keypad that is convenient for entering numerical values.